If a utopia is a society/world where everybody gets to be happy and free, a dystopia is a society/world where nobody (except the person or tiny group of people at the top) gets to be truly happy and free. A lot of times, an apocalyptic event is a great excuse for some person or group to set up their dystopia. The founders of dystopic societies aren’t picky, either. Any apocalypse they have survived and that has put them into a position to enact their bad ideas will do. Sometimes, the post-apocalyptic dystopic society is the result of the fact that humans can be really stupid, so they think they’re setting up a utopia and, oh, never mind…It’s all horrible now. A lot of the dystopias we’ve seen lately in popular books (and the films based on them) are post-apocalyptic. Which, sure, I get. An apocalypse wipes the slate clean (and, hey, as a writer I can’t hate the apparent freedom from “nobody would do that” that comes from a society that’s been wiped like that), and makes room for big and obvious changes. And I’m not here to hate on that. I’m even open to the argument that most societies in post-apocalyptic settings are dystopias, and that that is necessary for dramatic tension and plot to exist. I haven’t read All The Books though, so I’m not here to talk about that either. Because as much as a massive natural disaster or a man-made apocalyptic event can be enjoyable, it’s those dystopias that have less epic roots that really get at me. Those times where you find yourself looking at the world around you, the real one, and seeing the hints that, oh my stars, we could be headed there. I don’t think I read any dystopian books before I was a teenager, which seems weird to me…But, I also don’t know if I would have really noticed them if I had read them before my teen years, so, maybe I did? But as a teen…Starting to notice the things that are crap, unfair, dangerous about the world…Idealism in full bloom, in the heady and gorgeous way that mostly seems reserved for adolescents…Having had a little time to simmer on the distrust of government that Ender’s Game woke in me…I picked up 1984 and began to paranoidly fancy dystopian fictions, whilst also worrying that they weren’t just fictional. That we were headed that way. I managed to not let the dread kindled by dystopian novels drive me. I managed to keep it locked in a tiny cupboard inside me, to be pulled out when it was strongly merited. But, quietly, my subconscious was looking for the warning signs that we were headed for a dystopia about which I’d already read or for one that no writer had thought to warn us about. In my early 20s, I finally read The Handmaid’s Tale. No, I have no idea why it took me that long. Some failing of adults and supposed good influences in my life, no doubt. Heh. That woke me back up, pulled the dread and paranoia out of the cupboard and dusted the whole lot off. That one, as we started to learn how that world came to be, seemed (still seems) far too possible and real. And that’s when I realised that it’s not just the story of the dystopia that matters, not even if there’s a part where someone escapes or overthrows the dystopia (causing me to take note, lest I find myself trying to survive a dystopic scenario). No, if the author lets us see it, the road to the dystopia is just as important. But I’m one of those people who thinks that truth hides in fiction and we shouldn’t treat fiction as unimportant. 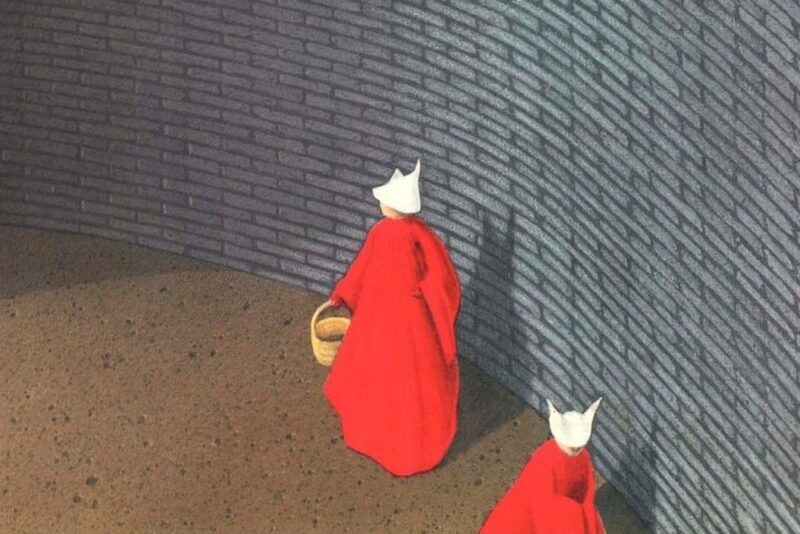 It was The Handmaid’s Tale that made me wonder if we would notice a dystopia creeping up on us. Because, sure, a terrorist group (or a fanatical religious group pretending to be another kind of terrorists) shot the government. But, you know, we’ll recover. We’ll sort it out. Humanity can totally come back from stuff like that. Oh, limiting of rights? Listen, it’s just temporary and isn’t a temporary sacrifice of rights worth it for freedom? But I’m not here to dissect our current world or modern events in Western countries. I always felt like dystopian fiction overlapped well with my enjoyment of cyberpunk, because I could so easily see the worlds, regimes, societies, ambitious antagonists in cyberpunk stories being the road to dystopias. There are other reasons I like cyberpunk and other noteworthy points, but we’re talking the road to dystopia today, poppets. I’m not here to praise cyberpunk things. Ready for me to pull this together? I’m exhausted as I write, so let’s all hope real hard as I jump into the next paragraph. I accidentally wrote a cyberpunk novel. I accidentally wrote a novel that is, arguably, an origin story for a dystopia. A road to dystopia. I just thought I was writing sci fi. That’s all I was trying to do with Peace Fire by the time I sat down to pour out the words. When somebody sent back notes and called it cyberpunk, I blinked. Oh, okay, sure…I can see that. Okay. Yes! It’s cyberpunk! I like cyberpunk. Somewhere in non-linear time, teen me was suddenly really pleased and she didn’t know why. And then I had a conversation with a friend. She’s one of those people who is quite smart, who reads loads, and who happens to do marketing so thinks about how to classify things. She kept using the word “dystopia” when talking about my book. If you read the stuff that came before this paragraph, you’ll know that this didn’t make me unhappy. But, I didn’t see it. And, when she pointed it out…when she helped me see that this scenario is a road to dystopia…when my brain imagined the dystopia that this book could dump everyone into…Oh. Suddenly, I was wondering when my dystopia-induced paranoia got dulled…Or maybe it was just no longer as loud. Had it been whispering warnings to me from the little cupboard in which I keep it, nudging my fingers as I told this story? Or maybe it was the lack of an apocalyptic event, now that those are so closely linked in the popular imagination…Or did I not see it as dystopian because I just assumed that you know you’re writing dystopic fiction when you write it? Just like you might assume you’d know if your real world was on the road to dystopia. I don’t think this will change the sequels. I’m currently working on draft 2 of book 2 and have book 3 outlined (including the ending), and I think I’ve got it right. But now that I see the dystopia on the horizon, it’s like I’m at the optometrist and they’re asking whether things look clearer through lens 1 or lens 2. And I was pretty sure it was lens 1, but lens 2 came down and I wasn’t even aware the world could be so sharp.